two had an all-time classic battle that ended in a draw by decree of Jeff Ross. people to ever do it. Crushed. Joe Dosch, the former (current?) champion. Tossed aside. 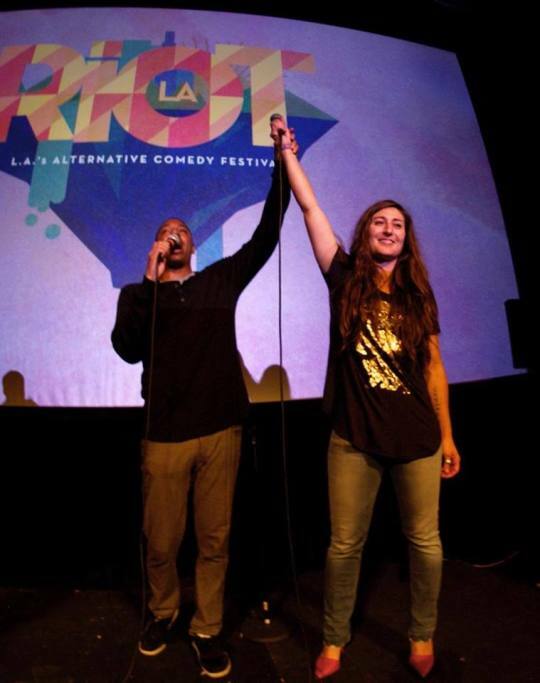 And it ended with yours truly at RiotLA. of her greatest Roast Battle moments with VerbalViolence.TV. with this constant fear brewing in your gut that the next joke might fall flat. anything – that’s why I got into standup in the first place. favorite battle that you’ve ever been a part of? greatest joke anyone has used against you? their ancestors.” I’m sure I messed it up, but man, it was such a good joke. I write about 20-30 jokes. A lot of people write more than that, but I usually stick to about that number and then just edit those jokes over and over again until they’re punchier. I spend a while trying to get one “you look like” joke that captures the essence of the person because I think the crowd likes it when you nail their essence. Then, I’ll send the jokes out to a group of “trusted advisers” and get their feedback – which ones they like best, any edits they have. While my friends are helpful, there’s a difference between reading the joke and hearing someone say it. A week before the battle, I’ll start to run the jokes at open mics. Some jokes that have crushed onstage get a bad reaction when I send them out, but something about me saying it out loud makes it work, so that step is really important to me. It’s hard to get laughs at an open mic in that context, but it’s a good way to get used to the rhythm of the joke by saying it out loud. I’d say about 95% of my roast joke writing is based on rhythm. I could write a perfect joke, but if I can’t say it in my speaking rhythm, I have to cut it or it’ll trip me up. Off-rhythm jokes always fall flat for me. I spend the last few days messing with the order, which is the thing I have the most trouble with. I’m focusing on that part going in to the battle versus Dan Nolan. favorite people to watch on nights where you’re not battling? retire, but not before doing three more battles. Who are the opponents? go head to head against the best, and then retire. witness a Roast Battle between any two comics ever, who would you pick? Should anything be off-limits in the Roast Battle? No, nothing should be off limits. I personally don’t write jokes about certain topics. For the most part, I won’t write a joke attacking a battler’s girlfriend/boyfriend or family member because I don’t think it’s fair to drag other people into it unless they’re just devices set up to insult the battler. I just think about how pissed I would be if I wasn’t a comedian and I didn’t choose to be a part of this, but suddenly I’m being publicly called ugly or fat or slutty just because my boyfriend wanted to do a thing. I also don’t write jokes about death in peoples’ families, but that’s just a choice I make based on my own life experience. Maybe the fact that I’m not willing to go there puts me at a disadvantage, but I don’t mind. 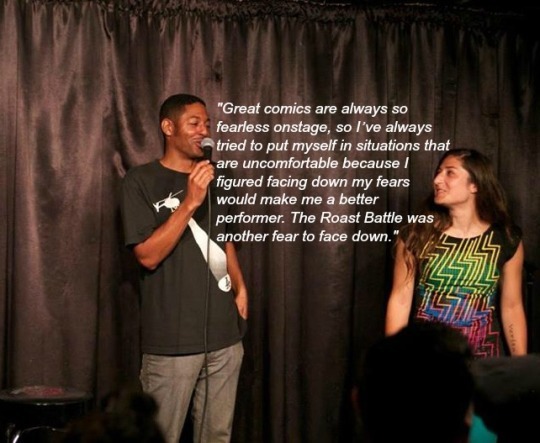 The biggest laughs I get are usually just from making fun of what the person looks like, and I’m first and foremost up there as a comic, looking to get laughs first.